Physical activity has enhanced my personal and professional life in so many ways. In particular, martial arts has sparked my passion for teaching and learning. What began as an outlet for an overly energetic nine year old eased me into adulthood. Training drove home important lessons about self-control, dedication and respect; lessons that would keep me safe from the many negative influences of my surroundings. And, through martial arts, I’ve met new people, forged relationships, and have benefited from countless enriching, life-changing experiences. I have studied karate, gymnastics, tae kwon do, boxing, kick-boxing, MMA (mixed martial arts), jiu-jitsu. I have also served as an active member of the Royal Australian Navy and am a qualified personal trainer. These experiences have instilled in me that a school is a community and teaching nourishes a community. I first saw capoeira on the silver screen, in ‘Only the Strong’. The fusion of dance, acrobatics, music and martial arts was entrancing. Capoeira quickly became my obsession. I began training in 1997 and in 2001, I met Mestre Cicatriz: a well-known mestre (master) from Rio de Janeiro, and the president and founder of Associacao Kadara Capoeira, with branches in Australia, Brazil, Canada, Indonesia and the Philippines. Mestre Cicatriz’s friendship, philosophies, teaching style, mentorship, his amazing depth of skill and knowledge of capoeira and Brazilian culture have influenced and shaped my journey in capoeira. I have studied, taught, played and performed capoeira and other Brazilian cultural expressions such as maculele (Afro-Brazilian dance) and batucada (Brazilian Carnival drumming) around the globe. In 2010, I attended an Annual World Capoeira Conference in Brazil where, Mestre Cicatriz graded me to the rank of first level instructor. This achievement was most important to me as it represented an integration of two passions: capoeira and teaching. In 2011, I opened my own school (a branch of Kadara Capoeira) in Toronto with the blessings of Mestre Cicatriz. In 2013, he graded me to the rank of second level instructor. 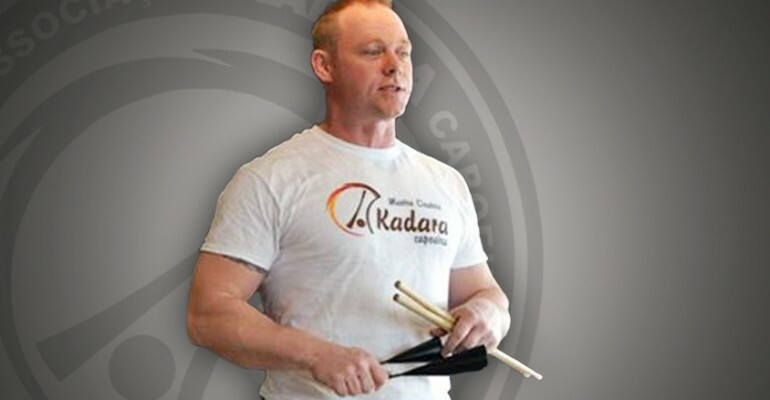 Mestre Cicatriz visits Kadara Capoeira Canada from Kadara’s Australian branch to teach workshops and oversee annual gradings. The experience of teaching my own students and taking on the responsibility of running an academy has allowed me to grow as a martial artist and mentor. As exhilarating as it is playing capoeira, what I enjoy most is seeing the growth of my students. From their first cautious ginga, their first cartwheel, their first kick, and first game and seeing that apprehension fade and perceived limitations being exceeded as new goals are set. Martial arts, capoeira especially, has helped me along that path. And now, I look forward to using my experience to guide others. In 2015 I took a group of 11 students to Brazil for the first international Kadara Capoeira Festival. During the Visit I Taught a number of Workshops , Our team Representing Canada had an amazing Journey Training and experiencing Capoeira in it’s country of Origin. I Was Promoted to the rank of Professor By grand Mestre Lotar and Mestre Cicatriz at the Grading festival and Formatura in Belo Horizonte. Since returning to Canada I continue my work educating the Public about Capoeira, Teaching My students the Values, Philosophies and Culture of Capoeira.